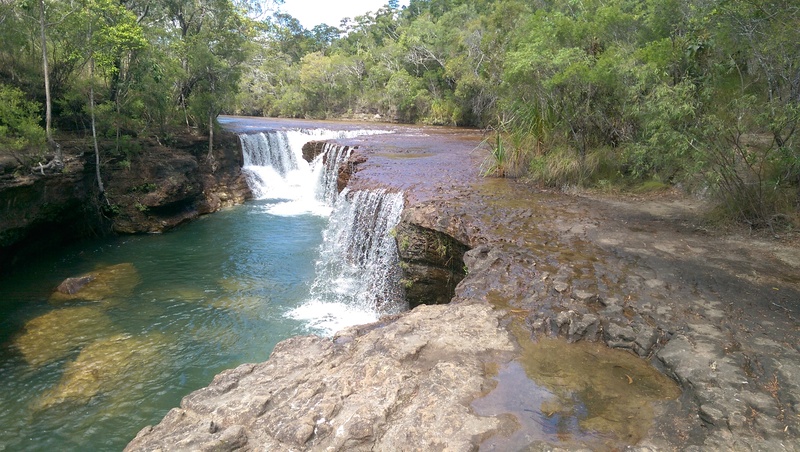 Canal Creek, Cape York, QLD. 27th July 2015. It is necessary here to jump forward on the time line a little because there is a story that cannot wait to be told. Let me set the scene. I’ve already mentioned the Old Telegraph Line (the Tele Track) and this story takes place on the second day of travelling up it. The track has several difficult creek crossings and I’d negotiated some of these in the company of two families in their fourbys (4x4s). Mick, Carley and Blake in one; Mike, Angela, Shakira, Deek and Jordan in the other. Mick had volunteered to take some of my luggage, which definitely made the soft sand much easier to deal with. We’d camped together at Gunshot Creek and at the time this story begins we were camped at Canal Creek, with plans to stay for a couple of nights as the location was so good. On Monday morning I did some essential maintenance on my bike, while the families were having fun in the creek, but at about 15.00 I decided to go for a swim. 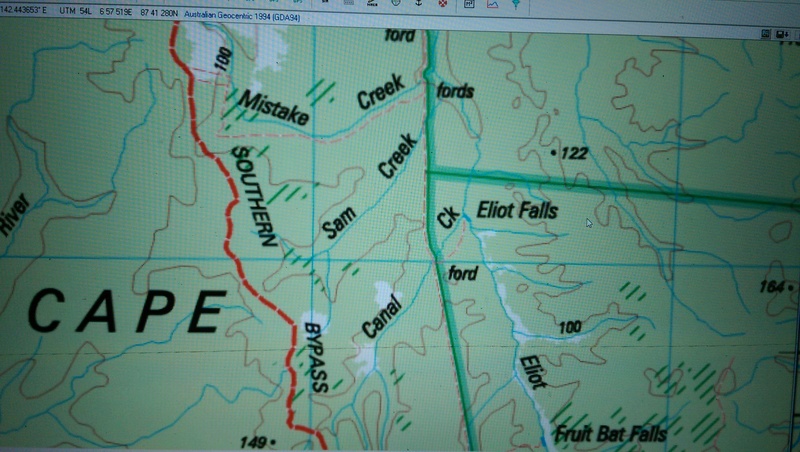 The map showed that Eliot Falls weren’t too far away down Canal Creek, about two kilometres, and then the walk back to the camp site from there would be about the same. So far so good. Mick considered coming with me but didn’t want to leave the others. So he walked partway downstream with me, looking for good fishing spots. Walked? Yes, because at that point there was little water and mostly bare rock in the creek. My bare feet didn’t like the rock at all and I regretted not having shoes to put on. My outfit consisted of swimming trunks, a pair of swimming shorts over them, a T shirt and a hat. Canal Creek joins Eliot Creek and I needed to have turned right up it. The north/south green line is the Tele Track, which would have taken me back to the camp at the Canal Creek ford. Mick turned back and I carried on, eventually reaching water that was deep enough to swim in at about 16.30. The water was really warm and pleasant and I was enjoying the swim. After a while I came to some waterfalls, a double set, in fact, but there were no people around and no sign of public access to them. I knew the Eliot falls would have been busy and that there would have been a path there. So, I carried on swimming, beginning to wonder where on earth these waterfalls were! Soon after 18.00 I decided it was time to turn back. Still no sign of Eliot falls and I’d given up on the idea of reaching them. And here is where I made one of the stupidest decisions ever. Instead of turning round and swimming back upstream I decided to take to the bush and cut across to the track. It was nearly dark. I had no shoes. What was I thinking of? Well, I was convinced the track was nearby and walking back would have been easier than swimming. So I took a bearing off the setting sun and the rising moon and headed north, back the way I’d come. Or so I thought. Walking in the bush with no shoes wasn’t really a problem at that point. Grass stems sometimes got caught painfully between my toes, but that was all. What I completely failed to find was the track I was seeking. At about 20.30 I came across a stream and fought my way along it knowing it would take me somewhere, eventually. Something that stumbling around in the dark clearly wouldn’t. And as per all the text books, after about half an hour the stream joined a creek. I assumed it to be Canal Creek so started swimming up it. 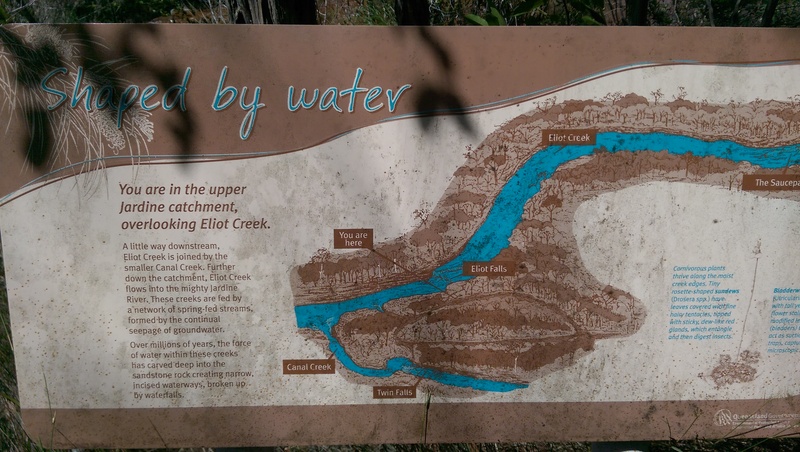 It took me about two hours to realise it wasn’t the same creek as the one I’d swum down. There were several features that were different. But I kept swimming upstream, it seemed the sensible thing to do. After all, I’d originally come downstream. At about 02.00 I came to another set of waterfalls and thinking there might be public access to these, I climbed onto the shore and settled down to wait for daylight. It wasn’t a very comfortable night. I swam through Twin Falls but didn’t find Eliot Falls. It gets light about 7am so I had a good look around and found no sign of any tracks or access. One thing the daylight did reveal was that this creek flowed from south to north. I knew that north would be best, having swum a fair way south already, so I about turned and swam downstream. The map in my head had Canal Creek running west to east and our campsite should be north and west of where I was. It was a shame I didn’t keep going upstream because, little did I know it, I would have come to Fruit Bat Falls, a place we’d visited a couple of days earlier, which definitely had public access. Eliot Falls, my desire to see them the cause of all my problems. The going was quite easy and the water was warm at that point. I had it in my mind I was now paralleling the Tele Track and that it was likely this creek would meet it at some point. I later learnt I was right but that point was a long way off. Once again, I passed the junction with Canal Creek without knowing it and just kept swimming, wading or bouncing down the various rapids. Because the rocks were so rough, I didn’t want to walk over them so I found the easiest method was to stick my feet out ahead of me, toes above the water, and let the current take me down on my backside, bumping from rock to rock. We’re not talking white water rafting type rapids here and it worked well enough despite the occasional knock. As the morning went on I heard helicopters over in the distance and guessed they were searching for me. It meant that I had been reported missing by my friends and also brought home to me what a terrible night they must have had, wondering where I was. Nothing to do but keep swimming and that’s what I did. A nice, gentle breast stroke, letting the current do the work as much as possible. Around lunchtime I came to a sandbank and was in the process of swimming past it when I had a brainwave. 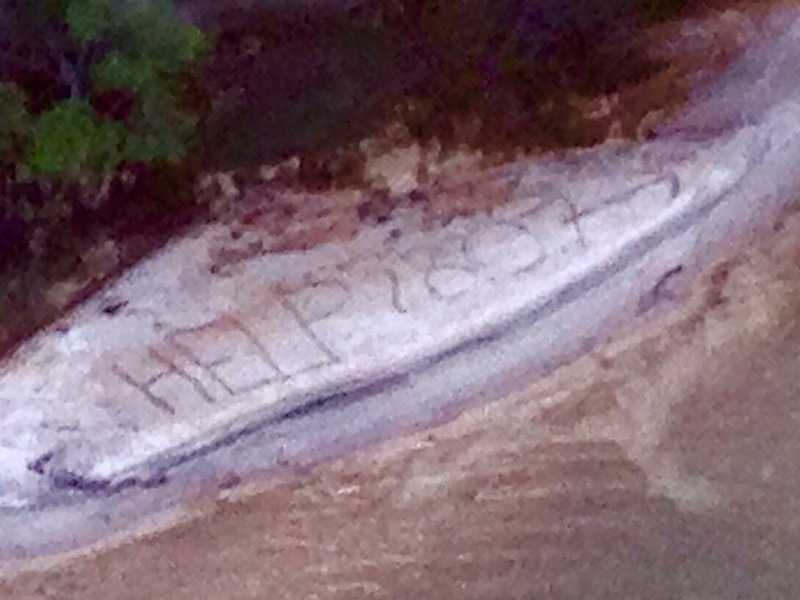 It seemed a good idea to help myself as much as possible so I got out of the water, found a stick and wrote a message in the sand, just in case the helicopter came down that way. HELP. 2807. –>. Help, today’s date and my direction of travel. I thought this would be enough to get any helicopter that saw it looking in the right place. At 3pm I’d got fed up with swimming and decided to try for the Tele Track once more. At least I had the sun to navigate by this time. But after three hours in thick bush, with darkness approaching, I had to stop. It was too difficult to make much progress and I was now dog tired, struggling to lift my legs through the bushes. The track may only have been a couple of hundred metres further on, equally it could have been five kilometres. I had no way of knowing. While I was lying on the ground once more, enjoying the occasional rain shower, I decided to head back to the creek in the morning. Apart from anything else, I was walking away from where my message indicated I would be. Not very sensible. As on the previous night, I tried to find some grass and foliage to cover myself with. Once again, it proved to be very thin rations. Fortunately it wasn’t actually cold and although I was getting very little sleep, at least I was resting. This was the type of bush I was walking through. Daylight saw me heading back to the creek and eventually I was swimming downstream once more. The creek was getting narrower now so the water was flowing faster and the rapids were more frequent. The water was also a little colder, although still bearable. My rather sore feet were getting a bit more punishment from the rocks too. The other problem was the number of trees that were lying in the water, often with submerged branches. I could usually see part of them sticking out and it became a guessing came as to whether I should go right or left to avoid the submerged parts. I could hear the helicopters out again but still not close to me. I began to wonder, too, whether my family had been informed yet. Around 13.00 I climbed up onto a rock in midstream for a rest and a bit of sun. Just as I got back in the water I realised my camera had fallen out of my pocket, into the creek. I fought my way back to the rock, looked around it and saw something shiny on the creek bed. But it was only a beer can. I was really, really upset. My camera is waterproof and had sat happily in my pocket for nearly two days. I’d taken some great photos during my river trip and now they were gone. A minor thing maybe, compared to the potential outcome of my predicament, but at the time it was a huge disaster. After another hour of swimming I went up onto the bank to sit in the sun for a while. Suddenly I heard a helicopter coming down river. I leapt off the bank into the creek but by the time I’d done so it had gone. I stood in midstream, yelling at the pilot to come back – and he did. He circled me once while I jumped up and down waving my hat. No reaction to my efforts. He came around again while I continued to jump up and down like a lunatic and this time someone waved to me out of the window. My ordeal was over. 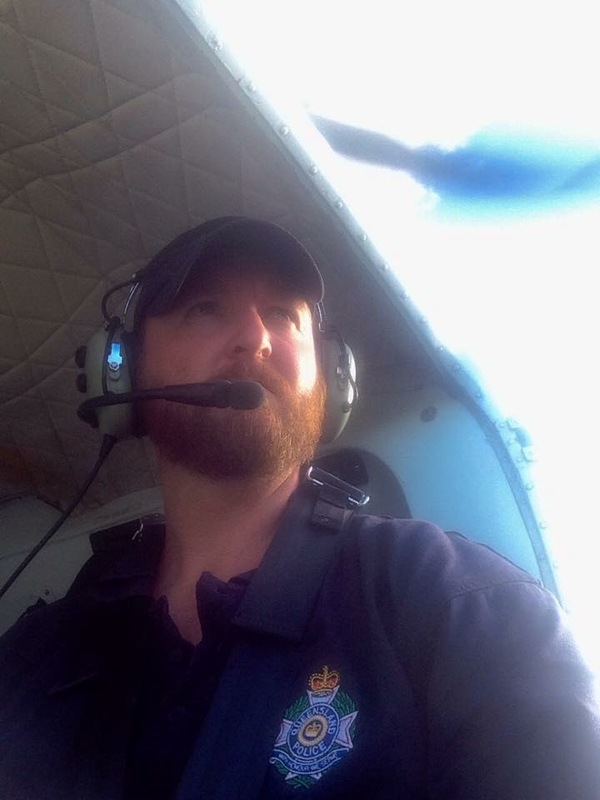 A selfie of Brad, the SAR coordinator. A short while later I saw someone wading downstream towards me. He wanted me to walk up towards him but I just couldn’t. He came to me and introduced himself as Brad. He was the police officer who was coordinating the search for me. They’d had to land on the bank about 600 metres upstream. Could I walk up there, he wanted to know. I had to say no. My feet just couldn’t take it and the current was too strong to walk against, especially across the rapids. He offered to take me on his back but I vetoed that idea. They were going to have to winch me up but that would mean a wait of over an hour. No problem to me now I knew I was going to be all right. Eventually a bigger helicopter came back and hovered over the creek, the down draught from the blade throwing water high in the air. Too difficult, so I had to move across to the bank where there was less tree overhang. Chris, the winchman, came down and instructed me in what to do. He put a harness on me, a helmet, earplugs and goggles, and we were clipped together. A signal to the controller up above and up we went, me cuddling him as per instructions. Once level with the helicopter platform I was pulled inside, strapped into a seat and given a helmet with speakers and a microphone. I must say at this point that I was super impressed with the whole operation. It’s difficult not to look at these things dispassionately and to note how they go about doing their job. In particular I was very impressed by the skills Chris displayed at putting me at my ease and explaining everything to me. Truly professional. That red blob swinging about in mid air is me and Chris. The paramedic who was on board checked me over. All the vitals were good, he was pleased with my condition. Even though I felt fine I was being taken to the hospital on Thursday Island, in the Torres Strait, where the Search and Rescue teams are based. I didn’t really mind. After all, hospitals have cups of tea and food. My son had been contacted, at 6am UK time on Wednesday, by the Foreign Office who’d received a message from the Consulate in Australia. Half an hour later they rang him again to say I’d been found. Fortunately he had yet to tell anyone else in the family so the worry was minimised. I was very pleased to hear that. I stayed in hospital overnight, had a nice long chat with my daughter, who rang the hospital, and was seen by the doctor in the morning. He said the cuts on my feet were already healing but gave me some antibiotics just in case I’d picked up any infection. I hinted at staying another night but he was having none of it. During the morning I had a visitor. The editor of the local paper, The Torres News, came looking for an interview. We had a nice long chat about travelling and blogging, and I talked him through what had happened. It seemed he’d gone through this process many times and I was slowly getting the feeling I was just one of many idiots that need rescuing, something that Brad had already hinted at. How the Torres News saw it. I had nothing with me but the clothes I’d been wearing at the time. I had to book a ferry ticket back to the mainland, which I could do over the phone with my credit card – fortunately the number is committed to memory. The hospital organised a lift to the ferry terminal and when we docked there were a couple of nice policewomen waiting to collect me. They took me to the station in Bamaga, the main town of the north Cape York area, and Nicole set to trying to find me somewhere to stay. I wanted to be in the town, with ready access to shops and the police station, so I ended up in a very expensive hotel, close to all facilities and with wi-fi. The search team had been based at Canal Creek, to the great delight of all the kids. 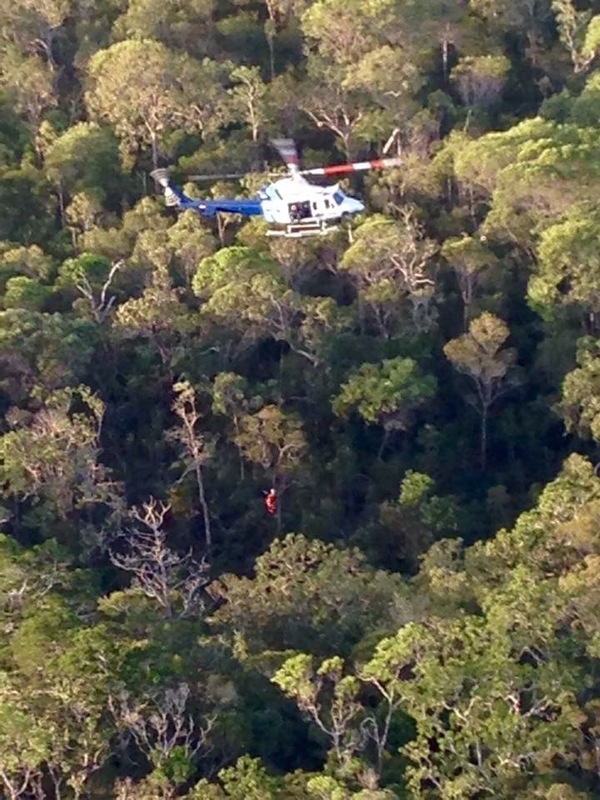 Three helicopters and a State Emergency Service mobile control vehicle kept their eye goggling. Mick and the others left at lunchtime on Wednesday, feeling they could do no more there and were very pleased when Brad rang them to say I’d been found. The police had gone through my belongings and brought items of value back with them, fortunately, so I now had money and my laptop, but no phone or personal belongings – sponge bag, change of clothes etc. The phone they found was my spare, which doesn’t work in Australia. But at least I was able to be independent again and the phone would take photos. 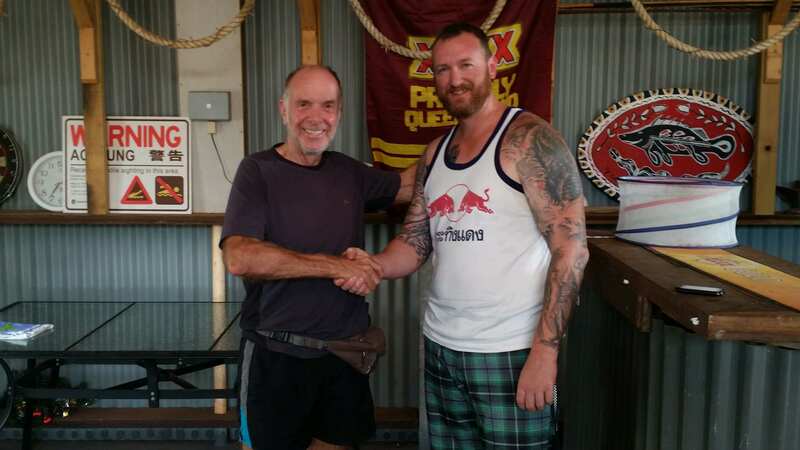 Mick had volunteered to bring my gear and bike to Bamaga but the police said no – shame, as it would have been really useful. I was in the hotel for four nights. I bathed my feet in Dettol and rubbed lotion into them trying to aid the healing process. I had no choice other than to walk the half kilometre into the town centre to get to the shops and to the tavern for a meal. The hotel had a restaurant but it was too dear for me. I think the walking helped and by Sunday I felt I could have ridden my bike again. All I needed was a lift back to Canal Creek to collect it. Brad had said the police would do that so I went down to the police station hoping they could arrange something. No such luck. There was no-one there but a couple of locals said someone should be back in a while. So I hung around waiting and eventually saw someone round the back. I went down there and bumped into an off-duty Brad who invited me to join them all for their lunchtime BBQ. Afterwards we went into the office and he talked me through the rescue procedure and showed me how they log everything down. Here’s the run down. Brad, as the coordinator, keeps a running log of everything that happens. Firstly to help keep track of events, secondly in case of an inquest! They attempt to profile a missing person, to help them decide how and where to search. Age, gender, physical and mental condition all come into it. A child will generally behave in a certain way as would someone with dementia. They worked out, from my journal and my blog, that I was fit and could take care of myself. My friends had confirmed that impression, as had my friend Phil, from Brisbane, who’d directed them to my blog. They had found my details on their system and Phil’s phone number had come up. They start a search at the last known position then work outwards from there. They knew where I’d headed to so that was the obvious place to start. Brad said that with someone like me they would have kept searching for five days before giving up. That’s comforting to know. Brad was in the helicopter that found me. They were searching Canal Creek again on the second day and he decided to extend the search area. That’s when they saw my message and came looking for me. 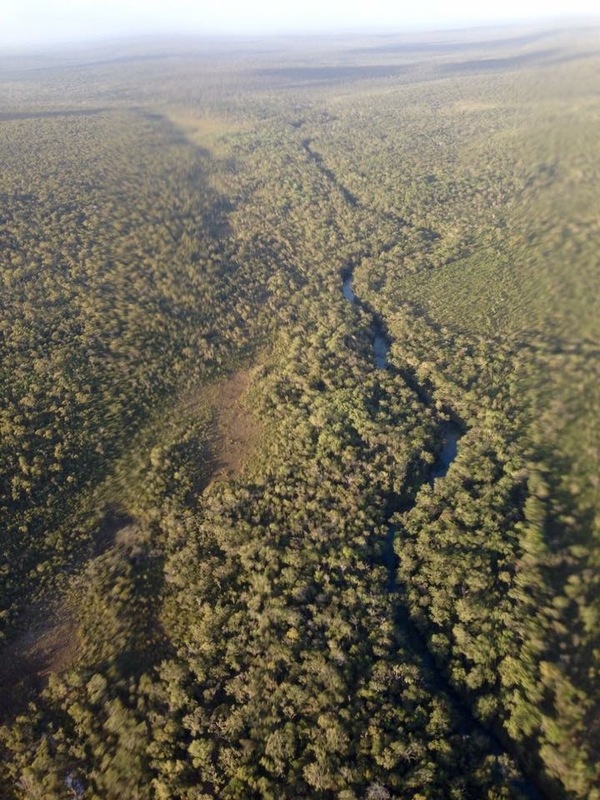 He showed me the terrain on Google Earth and I could see just how thick the bush is in that area. He reckoned I’d have been moving through it at 2-3kph and the Tele Track was about 15kms away at that point. It also became clear that the map of the area I had in my head was wrong. So staying with the creek was definitely the right thing to have done. I knew the Tele Track was west of my south to north route and was confident I would have found it eventually. He said I was right but it would have been a very long swim before I’d have come to it. 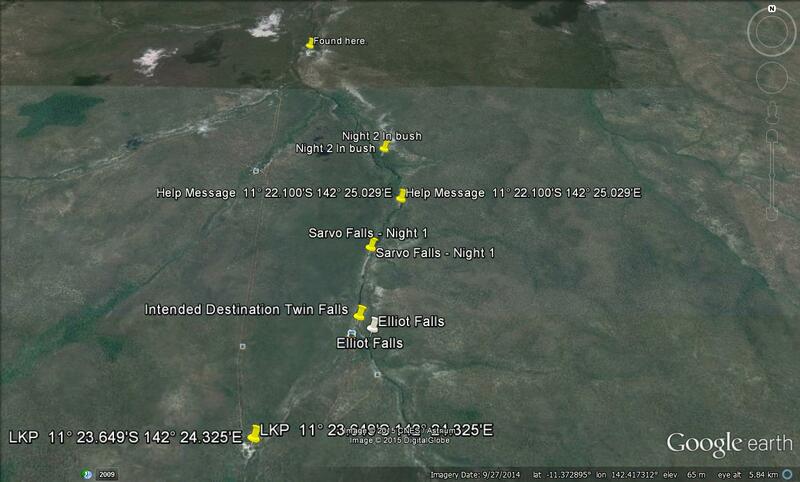 Keeping track of events on google earth. LKP is Last Known Position. I worked out that across the forty seven hours I was out there I’d walked in the bush for eight hours and swum in the creeks for twenty three. The remainder of the time I was resting. The helicopter Brad was in was just for tourists, with no winch facilities. They stuck around to watch the winching operation, undertaken by a much bigger, specialist machine. The pilot was struggling against a 35kph wind and Brad said his pilot was in absolute awe of the skill involved. I can safely say I was pretty impressed myself. SAR undertake about one search per week, mostly at sea. Brad said I was the sixth person he’d personally rescued that year. I felt a bit less of a fool knowing that. I asked him what the cost was. He said these rescues can cost up to $1.5 million but mine was much less because they hadn’t deployed the indigenous trackers yet. So between us we estimated about $200,000. Fortunately I won’t be getting charged! I told him I hadn’t thought it likely there’d be any crocodiles in that river because of the rapids, waterfalls, steep banks etc. He agreed, saying in the two years he’d been there only one croc had been sighted and that was only a rumour. Good, at least I was right about something. So that about sums up my misadventures. It’s safe to say that I’m very grateful to everyone involved in my rescue. Their skill and professionalism is incredible. I feel stupid but lucky. I’m also very sorry about the worry caused to my friends and family. Please believe me everyone, I won’t be doing it again! Shakira spotted this in a shop and persuaded Mike and Angela to buy it as a present for me Very apt. Hi Geoff – what a truly incredible story. So glad you’re safe. We’d love to speak to you for The Sunday Times this weekend, if you would be interested. Could you please email me on oliver.thring@sunday-times.co.uk? Thank you. Email on its way to you. Well Geoff; nice to hear the whole story at last though I’m sure you wish there hadn’t been one to tell! Riding south now? No more late night swims, eh?! I’m in Alice Springs now and despite the name, everything is bone dry. I couldn’t go swimming even if I wanted to! Blimey what an adventure. I heard from Liz last week, and she sent me the newspaper article. I’m glad you are back safe and sound. Next time you decide to go for a swim, don’t forget your walking boots, compass and a couple of days ration..lol. If it makes you feel better, I once got lost in Cobham Woods. It is so easy to get disorientated in these situations, well, that’s my excuse. Still good to hear that you are now ok, Take care..
We are keen to speak to you or your family back home about your adventure! Please contact the Daily Express news desk on 020 8612 7071 or 0208 612 7377 or email laura.holland@express.co.uk . Many thanks. What a story! I work for BBC radio 5 live and we would love to have a chat to you about this on air. If you’re interested in chatting to us – please drop us an email! Guess whast Geoff, you’re nearly famous. They just mentioned you on the radio world news. It’s ok they didn’t give your name. Nearly famous? It seems I’m all over the news website. Mirror and Mail, so far. I saw it on sky news this morning Geoff. Thanks Daryl, I will. It’s very weird to see my story on the news websites though. What an absolutely fascinating story. Thanks very much for taking the trouble to write it. I’ll send you a personal email soon but I want to say publicly how impressed I was by the skill and professionalism displayed by everyone involved. Truly awesome. I can safely say I was very glad to see Brad’s helicopter when it flew over me and then, of course, you and your crew. I wish you safe flying and you have my deep gratitude. I am a reporter working with the local paper/TV station where Geoff lives in the UK. Wondering if you or any of the other rescue crew would be interested in doing a little Skype interview with us about this story? Maybe borrow some of the actual rescue footage? Hi Geoff, please could we tell your story and use your pictures on the Evening Standard website? Thanks, Hannah. Perfectly OK to use the story and thanks for taking the trouble to ask. The others didn’t! Thanks very much and glad you’re safe and well! Hannah. Hi Geoff, Can you please contact me on louise.male@itv.com – would love to interview you on your adventure! The question is will you ever attempt to find the Eliot Falls again? Amazing story, glad it was a happy ending. Enjoy the rest of your adventures! Glad you were found and rleatively unscathed. You are definitely one of the lucky ones. I hope you left a decent donation at least to go toward the $800,000 that the rescue cost SAR. Yes, I am lucky and yes, donations will be made. Hi Ashley. Email coming your way. My name is Denise and I’m a producer with Radio New Zealand’s drive time news programme, Checkpoint. We’d love to hear you tell your story – if you could please send an email with your contact details we can try and arrange a time that may suit. Sorry to add to the list of media outlets contacting you! I’m a features writer from that’s life! magazine and would love to chat to you about doing a potential story for our magazine. Can you please contact me at stacey.hicks@pacificmags.com.au? We’d love to share your incredible story with our readers. Hi Stacy. Email on its way. Thanks Lisa. Yes, I’m very happy to be able to be here at Uluru, admiring more of Australia’s natural beauty. Andrew here at ITV News London – read your incredible story and I just wondered if you could drop me an e-mail when you get this please? I’m on andrew.dagnell@itn.co.uk. Would be great to speak to you about your adventure! An email is on it’s way Andrew. Brill thanks Geoff! Let me know in that email if you’ve got a phone number I can get you on – very keen to do some sort of interview with you for the programme! Thanks very much Aritha. Very nice to hear from you. After all I really hope that someone will find your camera someday! I just read your story on SPIEGEL ONLINE (DER SPIEGEL is Germany’s leading and Europe’s largest news magazine). So you’re famous in Germany, too. Love your post, by the way. Hi Miriam. I seem to be getting around. I’ve made it to Holland and Denmark too. Thanks for your kind comment about my post. You might be interested to hear Geoff that I came here through a link from a local Hungarian news portal….looks like your story really got around! 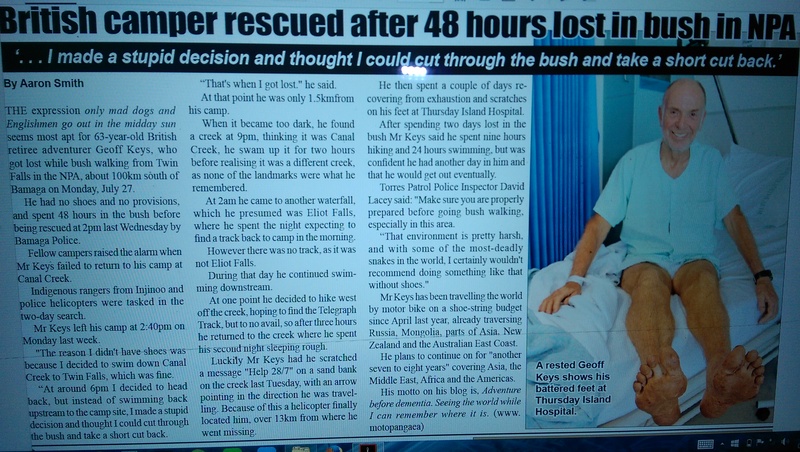 Hi Geoff, I work for the News Shopper covering Dartford and would love to have a chat with you about your amazing story. Please could you email Fiona.simpson@london.newsquest.co.uk or call 01689 885734 asap with your details so we can have a quick chat? Suggest you ask the press for evidence they’ve made a sizable donation to the $800K rescue cost before talking to them! What a story, I am glad you are allright. Here is some news about your trip from the Netherlands. They say that you are a very creative person, writing Help in the sand. Thanks for passing me the web address. I’ll take a look at it. I’m quite amazed about how far this story has spread. All the news outlets seem to like that photo though. Sorry to add one more media request to your list, but I work with the Kent Messenger’s new TV station KMTV. We are very glad to hear that you are okay and were wondering if we could have a little chat about it? Can I use your blog photos in our report this evening? My email is lgarcia@thekmgroup.co.uk. Maybe we could Skype or meet once you are back? I’ll get to the States eventually but I’m determined not to get out there! Glad to see you got out of that situation Geof, it could easily have gone the other way. How lovely to hear from you. Thanks for your kind comment and yes, it easily could have been very serious indeed. We never think about the rescue services that are there to help us until we need them. I’m very grateful that they were. In the meantime I hope you’re enjoying retirement but knowing you both, I expect you’ll be busy doing something. You’re famous Geoff! Heard you on the Today programme this morning. Can’t get more serious exposure than that. Delighted to hearthat you survived in one piece…..
Lovely to hear from you and I hope all is well with you. Yes, it’s been mental out there and the news story is in four European countries and Nigeria too. I can’t quite understand it all! Personal email on it’s way to you. 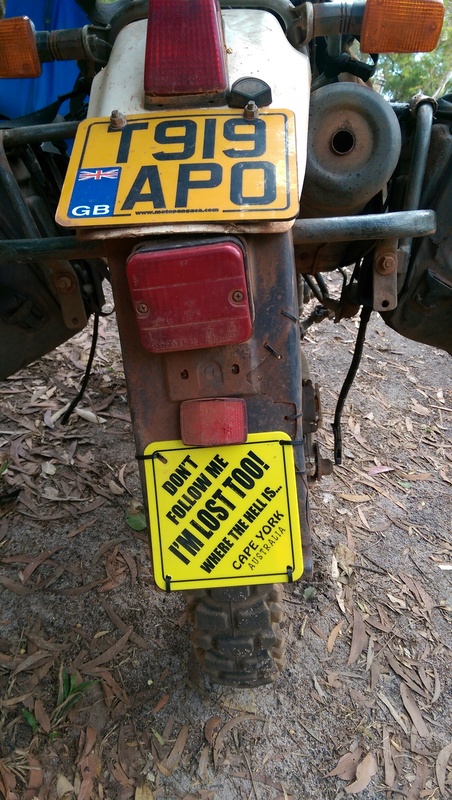 Hi Geoff – so glad you survived; quite an adventure! Hannah drew my attention to your story on the BBC News website after your “15 minutes of fame” on the Today programme! Olive Coleman, who’s working at the same company as me at the moment, pointed me to your blog. Anyway, enjoy the rest of your travels and don’t get lost again! So glad you’re OK. Hannah drew my attention to your story on the bbc website after your appearance on the Today programme, and Olive pointed me in the direction of your blog. Enjoy the rest of your travels, and don’t get lost again! PS – didn’t you used to work for AA roadside assistance? Want goes around comes around I guess! Very nice to hear from you and thanks for getting in touch. Yes, I did work for the AA and somewhere in among the things I learned was an ability to look after myself. It seemed to work this time. The really odd thing is that all this happened four weeks and 2,000kms ago and was rather in the back of my mind until now. Anyway, such is life and if nothing else, I’ve got lots of new followers for my blog. I might have to up my game a bit! So I hope all is going well with you post GHCS. I’d be interested to hear what you’re up to. Contact me, if you like on email. Olive has it. So glad you made it out. What a story! I work for the Digital Content team at Weather.com and we would love to chat/feature some of these incredible photos if you would be open to that. Feel free to drop me an email. Hi Bob. I’ve had a completely bonkers couple of days but I think it’s all over now. There’s a couple of news outlets here in Aus that want to talk to me and the Sunday Times magazine was talking about a write up, then I think that will be it. Thankfully! No way in the world would I have eaten my foot. Did you see the state of it?!? I hope you don’t mind me contacting you out of the blue via your blog! My name’s Alex, and I am contacting from the BBC programme ‘Close Calls’, which features people who have come into close contact with danger (and have caught some element of it on camera), but have escaped the situation and lived to tell the tale. We have a track record of making access based documentaries including City Hospital and Real Rescues and have worked successfully with many agencies including police, fire, coastguard, ambulance trusts and leading NHS hospitals over the last twenty years. The premise of the show tells the stories of people caught up in the incidents, as well as using testimony from witnesses and rescuers and archive footage. As I am sure you have guessed, I have come across your story of your adventure in the wilds of Australia and wondered if it would be possible to talk to you about getting involved in the show? Your whole attitude to life is awesome, and the recent rescue story is incredible to say the least! It would be wonderful if you could spare a moment to get in touch so I can introduce myself properly and tell you a bit more about the programme and just to have a chat! So please feel free to drop me an email, and i can arrange to give you a call, wherever your travels may have taken you! Many thanks and look forward to hearing from you! Researcher @ BBC’s Close Calls on Camera. didn’t know that we had a beer with such a popular person in the purples pub. You mentioned only the lost camera. Will follow your blog and wish to read relaxing stories in the future. What an adventure, luckily you escaped out of the situation. Let us guess which post had the most comments. To be honest I’d pretty much forgotten about it at that time. It was only later that the media frenzy hit me. I hope that from here on in, my stories will be all about birdsong, green trees and happy, smiling faces. Have fun on your travels and keep in touch. Please get in touch if you’re not entirely fed up of telling this story!